Please check carefully... in the case of first names only, verify that the Inlinkz entry number is yours and/or click on your name to be taken directly to the entry. Winners have until Monday, July 19th at 11:59 p.m. Eastern time to email and claim their prize. Random numbers will be redrawn for any prizes not claimed. Winners should email colorthrowdown@yahoo.com. In the email subject line, please write the name of the designer from whose blog you won and the prize. And please be patient... this is all very time-consuming and in some cases the companies will need to be contacted to find out how to proceed with the winnings. 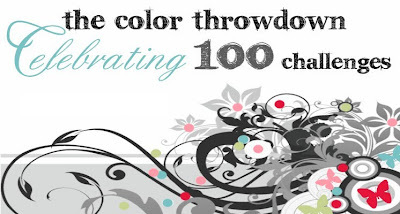 Many thanks again to EVERYONE for joining us for the Color Throwdown #100 Celebration! We hope you had fun, and will keep coming back every week for more challenges! If you haven't yet, be sure to join our Fan Page on Facebook! Our fans get advance notice of the colors on Tuesday evenings! Congratulations to all the winners! What a great celebration this was. Wow! Thanks for the prize, so many winners. This was a blast, such a fun celebration. Congratulations to all of the winners! Thank you so much! Hooray! I can't wait to play with my new stamps...it's Christmas in July! Congratulations winners! Enjoy your goodies! Thanks for the fun celebration. Yipee, it is always fun to win something, but most of all, ladies, thanks for making this such a fun challenge to do. Your weekly work and comments mean alot to those of us who love doing this challenge from week to week. Thanks again for putting this fun week together and lining up all these fabulous prizes. Congratulations to all the winners. WOW!!! I won some Stampin' Up! stamps. How awesome is that. Thanks so much! wow, love to see the list of winner and so many people getting goodies. Congrats ladies and thanks CTD for such a fun challenge! I am Thankful to be a winner. This was so much fun and everyone involved did a great job to make it happen. Thanks so Much. oh wow...thanks for the prize Lauri and Color Throwdown!! Thank you so much! I'm kinda new to cardmaking and this was my first entry in a Color Throwdown Challenge. How lucky am I!! Hi Ladies! Thanks so much for pulling my name ... I'm thrilled and so excited! You've made my week!! Just wanted to let you know that I've been emailing you at colorthrowdown at yahoo dot com all day and the email keeps on getting returned to me. I don't wanna miss out on my fab! prize for failing to contact you in time but I'm at a loss as to how to proceed. I suspect your email box on yahoo is full ... or my ongoing email problem is continuing ... but I was hoping that someone could email me privately to make arrangements? My email is debkneer at aol dot com and I won at Kisa Peters blog/Our Craft Lounge/Sparkly Fluff/Inspiration Emporium. Thanks a bunch Ladies ... sorry to bother you like this! You DARLING folks - ALL-O-YOU! Take my breath away! What an awesome and super classy way to ring in the mighty 100! It was such an honor to partake in such fun! Congratulations to all of the winners and AMAZING talent that was shared, enjoyed and acknowledged, along the way! Good, good times, for all! YEE HAW! I can't believe I won! Thanks so much, I just sent you an e-mail with all my info! Congrats to everyone! This was a SUPER FAB Celebration! It was so much fun to have so many prizes and just so great to be one of the winners! Thanks to Color Throwdown for hosting a memorable spectacular challenge!!! !